Mike Monteiro, co-founder and design director of Mule Design, has a new book called Ruined by Design: How Designers Destroyed the World, and What We Can Do to Fix It. 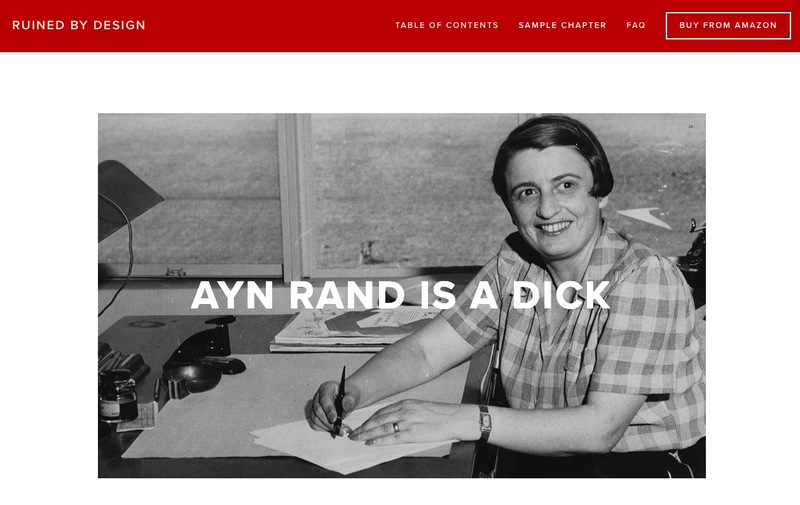 He posted a sample chapter from the book, about Objectivist philosopher Ayn Rand's influence on Silicon Valley. He's a funny writer! Libertycon is the annual conference of Students for Liberty, a libertarian youth group, held in DC; at this year's conference, Google was the $25,000 platinum sponsor, while Facebook and Microsoft were each $10,000 sponsors. In 1970, Chile elected Salvador Allende, a socialist, to office; he instituted sweeping reforms aimed at ending the corrupt rule of a small, monied, brutal elite; in 1973, the dictator Augusto Pinochet led a US-backed military coup that involved horrific torture and mass executions of political enemies.